1. Begin by printing out your free template and placing it behind an A4 sheet of Dovecraft Acetate. Secure the two sheets together with Washi Tape. 2. 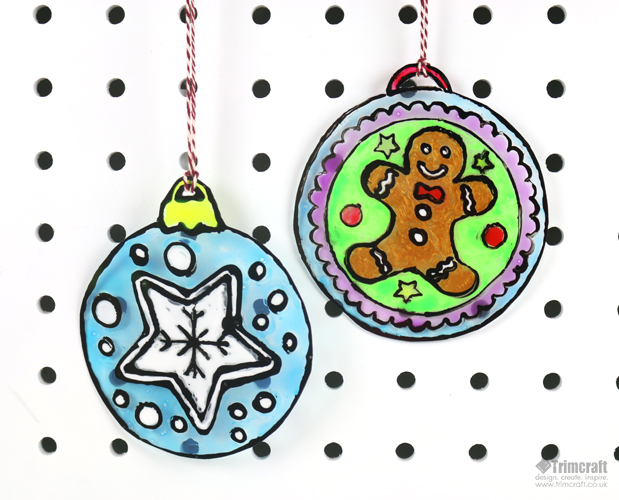 Starting with the ginger bread man design, follow the template and use the black Dovecraft Glass Paint to draw out the outline. Start from the middle and work your way out so you don’t smudge your design. 3. Once you’ve completed the outline, leave it to fully dry. Next, pick a colour to go on the gingerbread man. We have used the gold Dovecraft Pearl Effects as this matched the colour of gingerbread well. 4. Begin to fill the rest of the sections on your sun catcher with different coloured Dovecraft Glass Paint until it is completely covered. Leave to dry. 5. Once it’s fully dry, cut the shape out of the acetate, ensuring to cut a small hole at the top. 6. Thread through a length of Dovecraft Twine and tie a secure knot at the top. This sweet and simple design will be sure to bring some Christmas joy into your home! We also have a snowflake design which will really stand out when the sun is shining through! The Dovecraft Glass Paint are so bright and colourful! They’re perfect for your kids craft projects and they’ll have so much fun seeing their design come to life.